Japan is a long ways away from the skyrocketing growth the country enjoyed during its post-World War II “economic miracle.” Last week’s lower than expected GDP figures showed Japan slipping into its sixth recession since the 1997 Asian financial crisis. The world’s third largest economy also faces longer-term challenges, including pessimistic forecasts from the Japanese public, the hollowing out of Japan’s working-age population and the nation’s exorbitant public debt. 1Japan’s optimism about its economic future nosedived earlier this spring, according to year-over-year data. Just 15% of people in Japan expected the country’s economic situation to improve in the “next 12 months,” down from 40% who were similarly hopeful in spring 2013, after Prime Minister Shinzo Abe took office. That’s the smallest share expecting improvement in any of the 44 countries we surveyed. 2 Two-thirds (67%) of the Japanese see the public debt as a very big problem, according to our survey conducted before April’s tax increase. The primary reason for this hike, from 5% to 8%, was to rein in the national debt, which had ballooned to over 240% of Japan’s GDP. 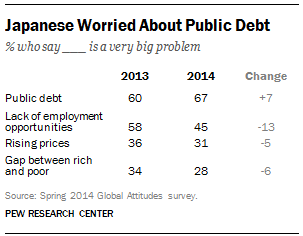 More Japanese see public debt as a “very big problem” than they do the lack of employment opportunities (45%), inflation (31%) or economic inequality (28%). 3Japan’s working-age population (ages 15 to 64) is expected to plummet to 55.2 million in 2050 from 81.2 million in 2010, a 32% decline, according to UN data. In 1970, 69% of Japan’s population (71.4 million) was of working age, compared with 64% in 2010 and just 51% projected in 2050. 4 Meanwhile, the country’s population is getting old, fast. 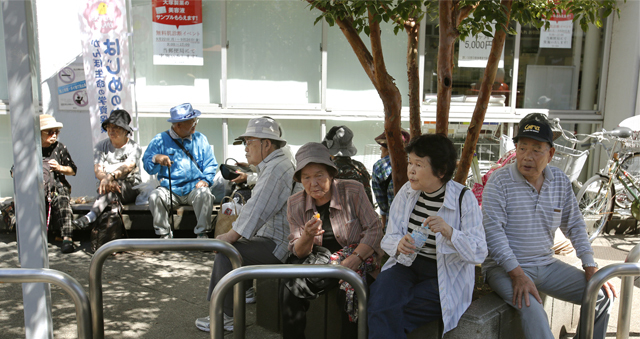 Japan’s elderly population is expected to grow to 39.6 million in 2050 from 29.2 million in 2010, a 35% increase. The country’s median age is expected to rise to 53 from 45. These trends are going to put a lot of pressure on Japan’s working-age population down the line. By 2050, there will be 72 elderly people (ages 65 and older) for every 100 people of working age, doubling the 2010 ratio of 36 per 100. Indeed, Japan’s old-age dependency ratio is among the highest in the world. Looking at other top economies, Japan’s not alone. Germany’s ratio is projected to be 60 per 100 in 2050, France’s is 44, China’s is 39, and the U.S.’s is 36. 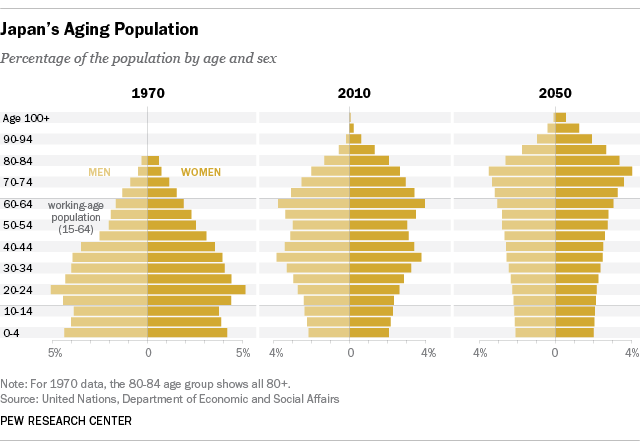 5While unfavorable demographics don’t necessarily portend economic doom, more than eight-in-ten (87%) in Japan view the growing number of older people in their country as a major problem, according to our spring 2013 survey. By comparison, 67% in China see this as a major problem, as well as 55% in Germany, 45% in France and 26% in the U.S.
6Japan’s rapid aging may also be become a social and economic burden for today’s children (or tomorrow’s workers). Just 14% of people in Japan say that children today will be better off financially than their parents. That’s among the most pessimistic views in all 44 countries we surveyed.